TheMetalBikini.com- X-Wing Miniatures and more: BoLS- Gamewire is Up and Running! As most of y'all know, I've been writing and re-posting some of my articles for Larry over on BoLS for awhile now. He's got a new service up and running and I did the crappy, ungrateful thing and totally forgot to post anything about it until tonight. 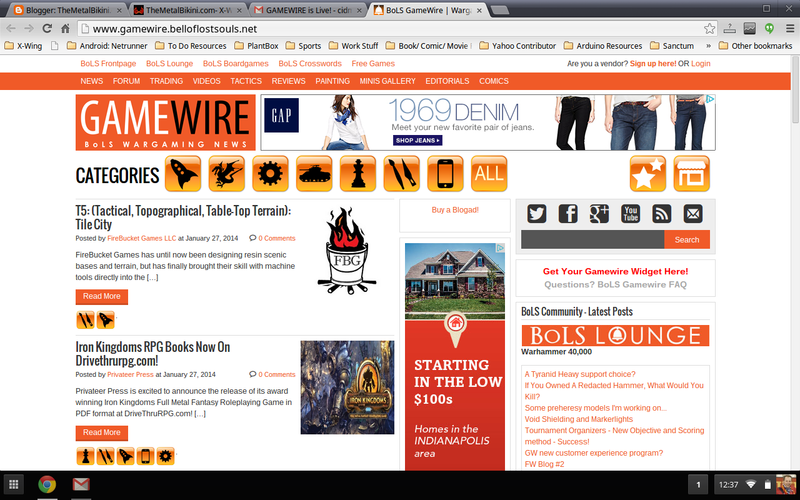 So what is BoLS Gamewire? The BoLS Gamewire is a wargames and miniatures news syndicator, designed to get breaking manufacturer news directly to the wargaming public. It is a viral news syndication platform that lets manufacturers reach hundreds of thousands of real world readers across a network of wargaming and miniatures websites at the touch of a button – all for free. The dude's a genius. I'm not even joking when I say that. If I had my head up even half as much as that guy, I wouldn't be working stupid-crazy hours in the factory. For reals. If you're not sure what Larry's gone and done here, unless I'm reading it wrong, I think he's basically just made himself the Associated Press of the wargaming industry. Congrats, Larry- well done you!